Tony Kelly challenged by Kilkenny's Walter Walsh. CLARE SECURED THEIR first victory over Kilkenny in Nowlan Park in 13 years this afternoon but certainly made harder work of it than was entirely necessary amidst an inevitable late backlash from their hosts. A sharper Banner side led by 11 points at one stage, eight by half-time and were still six clear entering the final quarter, only to be hampered in putting the result beyond any doubt thanks to 18 wides, 12 of which came in a much more competitive second period that allowed the home side a sniff at redemption. Backed by a large home support in the 6,416 attendance, Kilkenny outscored their increasingly profligate opponents by 0-4 to 0-1 in the final quarter and had the chance to make a full recovery, only to be denied by some dogged last ditch Clare defending. It was all so different in the opening half when the determined visitors fired a brace of goals from Shane O’Donnell and David Reidy by the turn of the second quarter to copper-fasten their superiority and build up a 2-7 to 0-2 advantage. O’Donnell crashed an opportunistic strike to the top left corner in the seventh minute while Reidy was much more fortunate 11 minutes later when an effort from his own ’65 was uncharacteristically spilled into the net by goalkeeper Eoin Murphy. Kilkenny did receive a much-needed shot in the arm when Bill Sheehan excellently flicked an Eoin Murphy free to the Clare net in the 21st minute. However they were too reliant on freetaker Alan Murphy as Clare finished the half on the frontfoot through Tony Kelly, the superb Reidy and wing-backs Seadna Morey and David Fitzgerald to cement a 2-12 to 1-07 interval cushion. Kilkenny stormed into the second half with the first three points through substitute Martin Keoghan, Murphy and Walter Walsh. But Clare held them at arm’s length mainly through Peter Duggan’s array of placed balls to ensure a 2-17 to 1-14 lead by the 53rd minute. Clare passed up too many scoring chances to make the game safe but they did dig deep enough to deservedly protect their perfect Allianz League record, their best start to the top division since 2005. Email “Reidy and O'Donnell goals fire Clare to first Nowlan Park victory in 13 years ”. 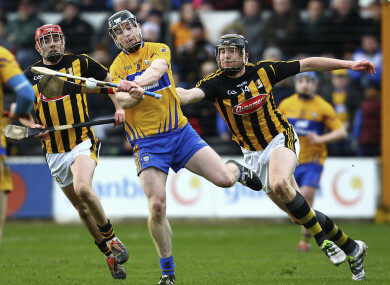 Feedback on “Reidy and O'Donnell goals fire Clare to first Nowlan Park victory in 13 years ”.